Sigma 15mm f/2.8 EX DG Fisheye Lens - Canon Fit. 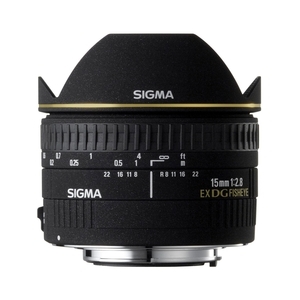 The Sigma 15mm F2.8 EX DG Diagonal Fisheye holds a unique position in the Sigma lens line up. The 15mm is a diagonal fisheye which means the distorted scene is shown full frame within the camera’s field of view. Using acute perspectives not seen by the human eye, this lens is an essential for taking eye-capturing images. The large F2.8 aperture makes the 15mm capable of overcoming any lighting situation.